Every place gives you something – a gift, a new insight, courage when your heart is failing, and sometimes, just occasionally, wonder. In Amsterdam a few years ago, I discovered Het Begijnhof. I fell slightly in love with this sanctuary in the heart of the city and with the idea and history of Beguinages. Bruges or Brugge had already been on the cards, recommended by a colleague who, it turns out, knows me well. 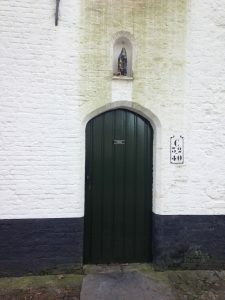 Learning that there was also a Beguinage was enough – I bought a ticket and headed down into the underground gloominess of Gare Centrale to wait for my train. The train trip and the chance to see the country-side was part of the joy of this journey. 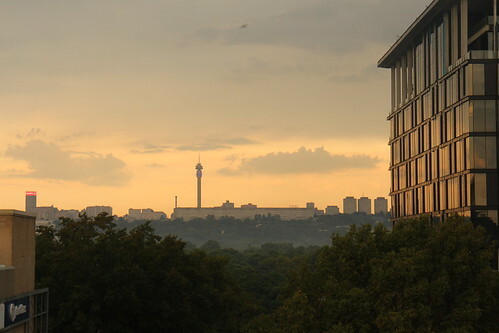 It’s easy to stay in one place, in the city where there is so much to see. But wonder comes in many forms and the country-side, especially when seen from train-windows, is a peculiar kind of joy. A joy complete with the space to write the journey. Winter trees. The sky clouding over with soft grey and white billows. 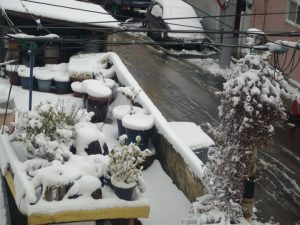 The houses narrow and upright, with snow-sloped rooftops and many chimneys. Red brick – in all shades of red – to brown and beige and painted white. Some semi-detached, just two windows wide; some standing alone, three or four windows across. Each small settlement with a church-tower – red-brick pretty or imposing gothic grey against the sky. The fields stretch green and brown, between stands of winter-bare trees, in the gaps between the settlements. A field of Shetland ponies behind a house surrounded by open land. Chickens in a run fenced with posts of dark, dark wood. Where the fields have been rested, the grass, dry from summer, stands knee-high, winter-dry white-brown. Several stands of young pines – next year’s Christmas trees? Settlements pass. A car-wash, a petrol station, a parking lot. In a yard, a trampoline with raised sides for small children. A jacket flaps on a washing line. More open land. A tiny brick wendy-house, half-hidden by ivy. Three geese in a field. A rugby pitch. What looks like a convent school or university college. So much water – rivers and bridges again. In a green field, a group of sea-gulls comes in to land. The first canal, complete with boats. We are travelling in the direction of the sea. Ducks waddle in a row – grey and white and brown – along a strip of grass to a water-filled furrow. Sheep graze among stalks in a black-soil field. A house with a built on glass conservatory. Almost there now. A house further out surrounded by fields and near the train-line. Outside a bicycle and a pile of freshly chopped firewood. From the windows, the warm glow of lights. In Bruges, I walk away from the station and take the path towards Minnewaterpark, with it’s pretty canals and Lake of Love and fortied gunpowder tower. The sun came out just as I arrived in Bruges and for a while it adds a sparkle on the water to the crisp afternoon stroll. Waterbirds, including snowy-white swans, decorate the lake and canals. 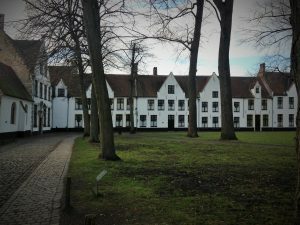 A twist and a turn and I find the Beguinage. From the moment you enter the complex, you can feel the peace. Signs on the grassy, tree-scattered central square ask for silence. Each white house, with its red roof, is a home. This is no longer a community of Beguines. Since 1927, it has functioned as a community for Benedictine nuns – a contemplative order that also holds special meaning for me. The place is beautiful and calm and not all the tourists wandering around can change that. Before crossing another pretty bridge over the canal, I even wandered through the gift shop. The remainder of the afternoon is whiled away peacefully. Roaming the medieval city. Admiring lace and chocolate in lit-up shop windows. Enjoying the houses and restaurants on the water, and the city hall, museum and fries with mayonnaise on the square. Along the streets, the crowds walk quickly or meander and the clip-clop of horse-tours is a constant companion. Back along the canals, where the birds are resting on froze shards of water. Back to the station, one more ticket, a wait on the platform where I wonder for a while about the drifts of salt before I finally figure it out. 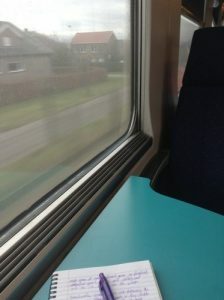 The train is warm and pleasant and the countryside we pass, once again beautiful. I am peaceful. I’m glad this trip was suggested. I’m glad I took the advice.